illus. by Elizabeth Catlett. 32p. Bloomsbury. Jan. 2019. Tr $17.99. ISBN 9781681199559. 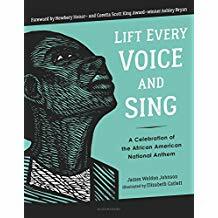 PreS-Gr 3—In this reissue of the official African American National Anthem, officially adopted by the NAACP, linocut illustrations by Elizabeth Catlett accompany the stanzas of the anthem on the opposite page. Though each linocut was given a caption when created by Catlett, great care was used to illustrate specific stanzas with artwork that thematically represents the meaning of the text. The linocut illustrations allow for a more dramatic silhouette, while the contrast between the black and white composition of the image aids narrative fluidity, especially when depicting clothing. Vivid realism flourishes as each linocut conveys the deepest significance of each stanza and the historical struggles of African American men, women, and children. The original captions for each linocut as well as the musical score for the anthem are included. Turquoise images reminiscent of kente cloth patterns border each page. A foreword by beloved author and illustrator Ashley Bryan introduces this striking collection of art and lyrics. VERDICT This updated tome is a stunning addition to the narrative legacy of African American history and an introduction to a remarkable art form. This welcome new edition of a 1993 picture-book version of the song known as the African American national anthem is illustrated with the Harlem Renaissance artist's strong, stark, and striking black-and-white linocuts. As the original Horn Book Magazine review wrote: "the portraits and the lyrics tell a powerful story of struggle and triumph and hope." The musical score and a (poetic) new foreword by Ashley Bryan are included.